Home > TRAVEL > SHIGA > OTHER > SPOT > Train for your own Ninja License in Shiga! Train for your own Ninja License in Shiga! For anyone that thinks of Japan, there’s always a few things that jump straight into their minds. One of these things is Ninjas. An iconic symbol of Japan and its history, Ninjas have always been portrayed in popular media as being strong, quick, and stealthy. Well, whether you possess these qualities or not; you can gain your own Ninja License at the Ninja Village in Koka, in Shiga (a train ride from Kyoto). The ninja experience really starts when you arrive at JR Koka station. 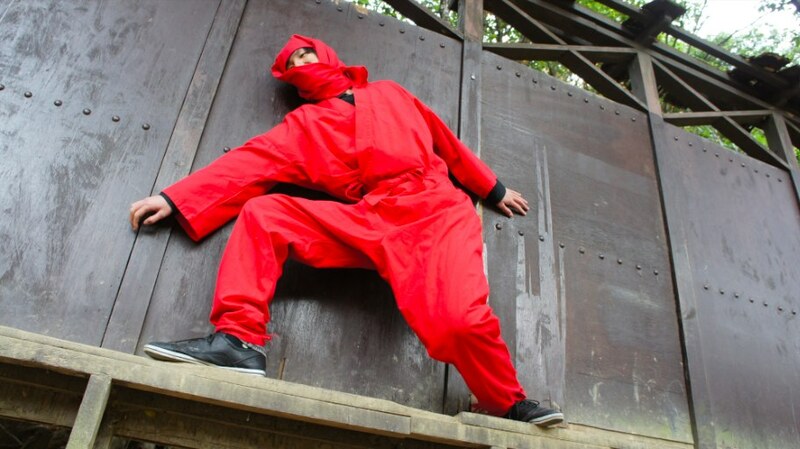 Throughout the station are painted optical illusions that if you pose just right, make you appear like a master ninja – before the training has even begun! There is a dedicated shuttle service that will take you up to the ninja village – just ask whoever is working at the station (English is just about ok, as they know what you’re going to ask about). But, if you’re the adventurous type, and good at map reading, I recommend walking. It probably takes around 30 minutes to walk there, but you get to see some beautiful sights and feel like you’re really traveling to a secret ninja hideout along the way. When you arrive at the ninja village, you have the option to dress up in ninja gear (and who could refuse?). They have a wide variety of colors to choose from, but I couldn’t resist the classic black! They also have a range of sizes so foreigners don’t worry! You are given a ninja scroll that you must complete, it has a map of the village on it too, so you can find your way around. Each area has a challenge to complete, and a hidden kanji to find. Write the kanji on your scroll and hand it in at the end to complete the training! We didn’t know about the kanji side of the training, but as we were foreigners and looked completely lost, they let us complete without filling it in! So don’t worry too much if you miss that side of things! The challenges are all good fun and don’t worry about fitness levels; there’s nothing too taxing on the list! All the challenges are suitable for children and adults alike – and most of the children there that day were much better than I was! But that’s not all, undoubtedly the best part of the ninja training experience is learning how to throw shuriken (Japanese throwing stars). They have a whole area set up with lots of targets, and the guys there will help you out to make sure you know how to throw the stars correctly. I really enjoyed this part of the day, I felt like a real ninja! When you’ve handed in your completed scroll, the ninjas will present you with your very own ninja license! Congratulations, you are now a licensed ninja!! ・Toei Kyoto Studio Park: Experience the Japanese Movie and Anime fantasy world! Are You In Kansai? Don’t Miss This Soundscaped Japanese Garden! Experience These 3 Ways To Transform Yourself Into a Japanese Warrior! Share a drink with Penguins in Kobe!